Rise Of Civilizations is a city building game for Android and iOS in which the player takes a role of leader and grow the city by building and upgrading a wide range of facilities. In the last post, we shared a complete guide for the beginners, you can check it here. In today’s article, we have shared 9 top Rise Of Civilizations tips, cheats & tricks that will surely help you in building a safe & secure city. The VIP level is different from the governor’s level or city hall level. First of all, let’s understand the VIP mechanics. In other similar games such as Game Of Sultans, Be The King, and more, we need to spend the real money to activate VIP. The VIP badge provides exclusive buffs to the city such as action point recovery(action points are used to attack enemies on the world map), hospital capacity, food/wood/stone/gold production, training/building/upgrading speed, and much more. 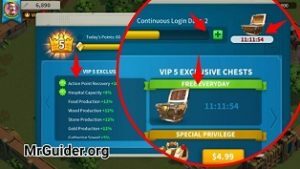 In Rise Of Civilizations game, you can activate the VIP using gems. Yeah! Gems! You should not use gems in any useless tasks such as buying speed-ups, instant upgrades, and more. It would be waste. Spend all these gems to increase your VIP level. On the main screen, at the top-left corner, tap the VIP icon. After it, hit the + icon and use the gems. You can easily reach VIP level 6 by using the free gems(you get gems by completing the certain quests, in events, as a reward – check the mailbox daily). On the same screen(VIP Menu), you can claim the VIP chest(on the basis of your VIP level). You get this chest every day, it contains lots of items such as food, wood, speed-ups, and more. And don’t forget to claim the free VIP points. VIP Points are required to increase the VIP level. In the above tip, we explained to you to spend gems to obtain VIP points(to increase the VIP level). By default, Rise Of Civilizations game gifts you free VIP coins every day. And the best part is if you log-in continuously or collect this chest every day, the game will gift you more points the next day. For example; for the first time, you get 20 VIP points. Next day, you will get more than 20(but you need to log in continuously). After reaching a certain level, your city will start getting attacks from the intruders. And if you have not assigned any commander to the wall, then you should do it. When an intruder invades the city, the Garrison commander lead the troops to defend the beautiful city. By default, in case you have not assigned, the game will choose a random commander(highest level). But we would recommend you to assign it. 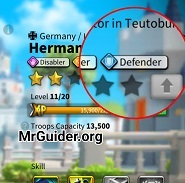 Tap on the wall -> tap the shield icon -> tap the + icon to choose commanders; you can choose up to two commanders; primary and secondary. Now the question is whom to choose. In the last post, we explained to you commander’s type. Read our commander guide here. Choose the commander(defender type). Defender type commanders are good at garrisoning cities. Build the courier station in the city for merchants and officers. Merchants come to this building and sell speed-ups and rare items. You can purchase some items in exchange for resources such as wood, food, and more. Make sure to check the merchant boutique daily and grab the best deals. And if there is no deal or merchant in the courier station, then wait. In Rise Of Civilizations, defending the city is a challenge. If you are not paying attention to the watchtowers, then you should start. These watchtowers can attack the intruder’s army and defend the city. 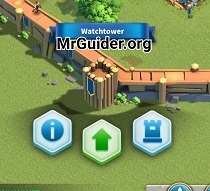 Upgrade the watchtower to increase their attack power, health, and power. As per the current version of the game, its maximum level is 25(city hall maximum level is also 25). It may increase in future updates. On the world map, along with the enemies, cities, resources, you may interact with a pile of gems. Tap it and send the troops to collect the gems from the map. To become eligible(to gather gems), you need to complete the research(name – Jewelry) in the research center/academy. After it, you will be able to gather the gems on the map. Rise Of Civilizations game also features PvE mode(Expedition), can be accessed by tapping the menu button on the main screen, bottom-right corner. This mode has 70 stages. And the maximum reward you can earn from this mode is 300 medals. You can play this mode’s stages multiple times a day, but you will get the reward only once per day. We would recommend you to focus on this mode and complete all the stages. And repeat the stages next day. You earn medals, chests, commander EXP(tome book), speed-ups, and much more from these stages. You can spend these medals in the medal store for sculpture, speed-ups, and more. Go to the expedition mode, at the top-right corner, tap the shop icon to visit medal store. You earn individual credits by helping the alliance members and donating the resources in technology research. You can spend these credits in the alliance shop for items. However, it’s not available now. But will be available in the future versions. In the academy, you can research two types of technologies; economic and military. To increase the attack power, defense power of army units, you need to research in military technology center. And it also unlocks new units. And make sure to keep training the troops. Don’t ever stop. Because you need millions of troops; as you progress, your city will get more and more attacks. The more troops you have in back-up, the better it will be. So these are our top 9 Rise Of Civilizations tips, tricks, and cheats for the beginners. You can read the Rise Of Civilizations guide here. Economic research is more important since it will save you research and building time.